PaperRamma: unique bridal shower signage, custom nursery art prints, creative travel maps & more... http://www.paperramma.etsy.com | Proud to be featured in HGTV magazine, & you can also find us on theknot.com! Remember your bridal shower fondly with this unique and custom signage! 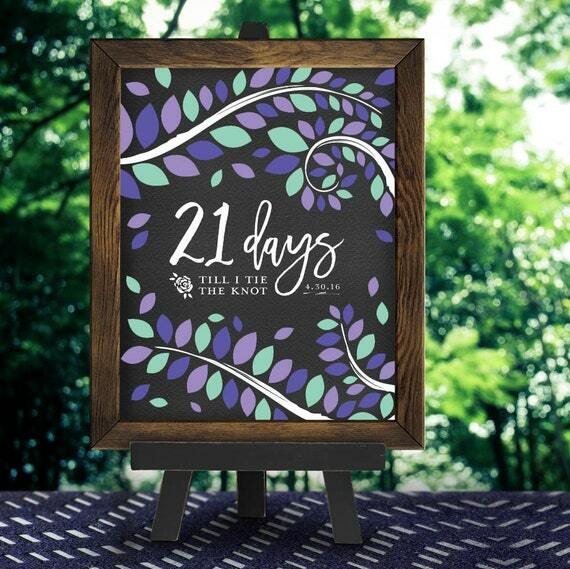 Let everyone know how many days until you tie the knot and become the lucky Mrs... Use this special print simply as bridal shower signage, or as a guestbook – the choice is yours! Your guests can interact with this design by signing their name or leaving a short message on each leaf. This versatile piece can also be displayed at home as a wedding keepsake for years to come! • Your choice of colors: coordinate your guestbook to your wedding colors, the decor in your home, or just about any color palette (included). • The date of your bridal shower, and how many days until your wedding!